This tarot card is a sign of release and liberation. This tarot card relief shows a bird which flies from the hand up into the air. It symbolizes sublimation – the sublime – of being and detachment from past. 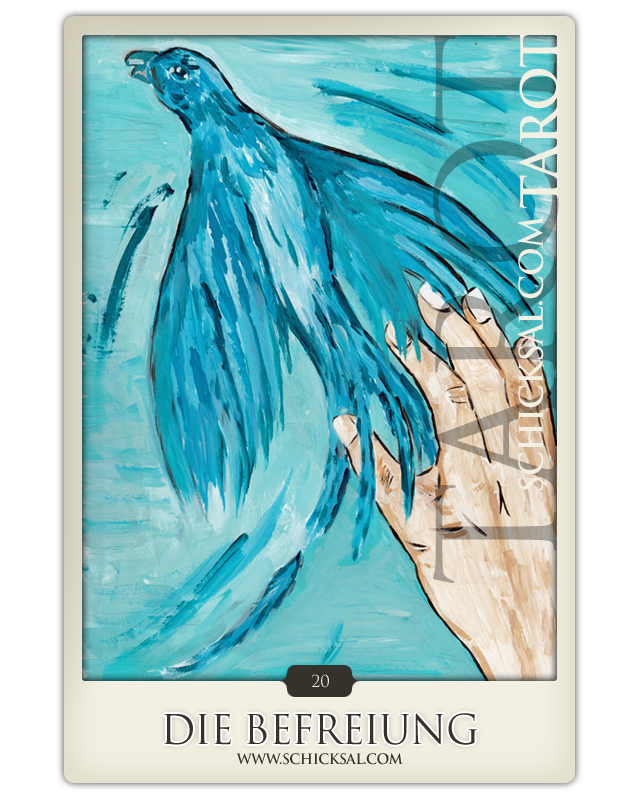 This tarot card is a sign of release and liberation. You can leave your fears, [self-] doubts and compulsion behind. You will get the chance to reconcile with all you would like to let go…possibly to compensate for something. Finally you can let them go! The card relief offers introspection. Courage - as a part of your energy - gives you the strength to changes. Finally this should prepare a better understanding of yourself and the world around you. The new self-concept and self assessment brings new order. It is presumably the beginning of sublimation – and maybe sublime. Then - here and now – the time has come - or will [have been] come for some changes and challenges. Hence you might trust in yourself, your strength and belief. However, it gives you forgiveness. The negative side of this card relief symbolizes sublimity. In superiority: Own mistakes are not reflected and neglected. In opposite way it is not shown what has importance and what should be done – and what others do. It is important to give reconciliation. The future based on the here and now, yesterday as well, the time of your past – there is no time out of consequences. With regard to love and relationship the next step to sublime could have been taken. Development and personal change influences our strength. Leave stress and grievance behind and tend to forgiveness – towards your own mistakes and the mistakes of others as well. Be joyful to take a new chance and opportunity to give up wrong actions. The time has come to change and to accept new challenges and orders. It is not important if you are within a relationship or not. It has no significance to achieve new kinds and forms of experiences. It is up to you to decide-it does not matter which way you will go. The tarot card relief represents that there is a good new way to get your true professional destination. Mistakes from the past could be left behind… but it should be part f your consciousness. You are able to recognize the result of your experiences and have to expect consequences of your deeds. There is no more room for doubts and fears. You can believe in your capability. Today the day has come to say good bye to your doubts and fears. Leave your past behind and take a new direction. Maybe you would have got the rewarding of something you had done. The rewarding of former deeds or former work you did. Now enjoy this day right into your eyes – in your perception and consciousness – that is your way and value. Expiation, forgiveness, responsibility, renewal, relief, detachment, liberation, release, solution, conclusion,rewarding, reward, chance, apology, alibi, confidence, faith, self-awareness, sovereignty, sublimity.